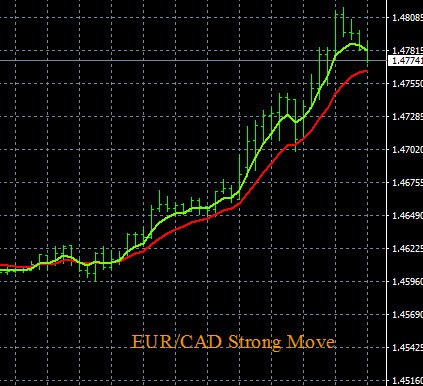 Today in forex trading the Canadian Dollar (CAD) strength drove price movement on all pairs in this group. The EUR (Euro) was also weak, so the EUR/CAD pair dropped. This pair is in a strong downtrend but it is at some historical support levels, so we would scale out some lots and take some profit. A some point it should continue lower since the trend is so strong. The USD/CAD also dropped on the CAD strength and this pair is at one support level. The trade signals you see for the CAD pairs below are from The Forex Heatmap®, which is a visual map of the spot forex that provides live signals for 28 pairs. 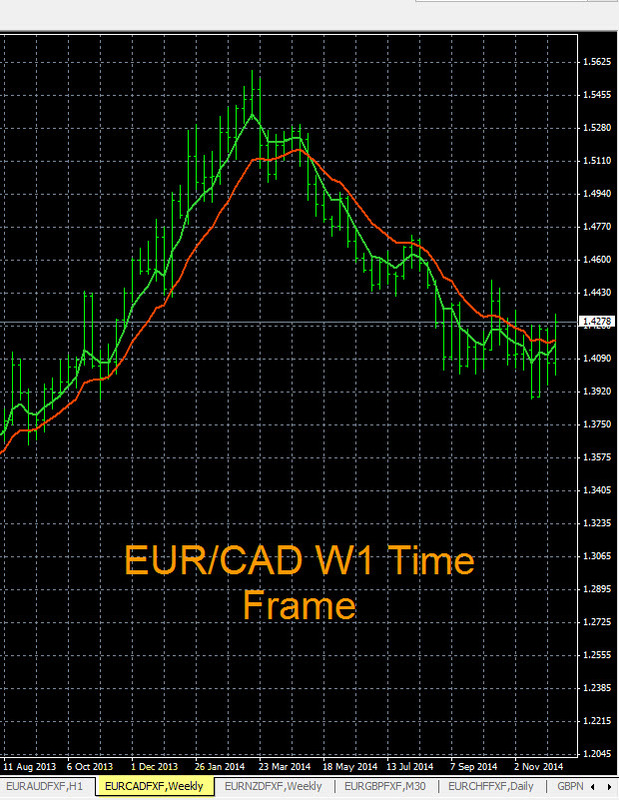 The EUR/CAD chart is shown below, this is the W1 time frame. We are looking for this pair to form a new trend on the W1 time frame in the next few days. Look for any strong buy signals on The Forex Heatmap® on this pair going forward. This pair is somewhat choppy now on the smaller time frames, but if the trend forms the overall potential is excellent. Current pricing is around 1.4280, and the upside potential is up to the 1.5400 area, so over 1100 pips is possible. Excellent money management ratio on any buy signals. Today in forex trading the EUR/CAD signaled a sell on The Forex Heatmap®. In the main trading session the Canadian Dollar (CAD) strengthened on all pairs. The EUR/CAD moved down and could continue down one more day on the H4 time frame before it starts to hit some support levels, we would scale out lots on this sell. The CAD/CHF also moved up and we would scale out lots on this buy, it should also continue up one more day on the H4 time frame. These pairs are moving inversely to each other on the CAD strength. The live forex signals you see below are available for 28 pairs from The Forex Heatmap®. 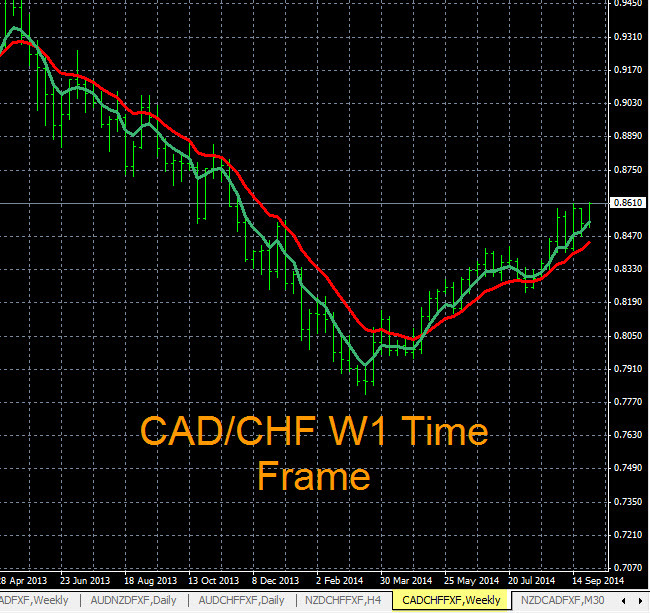 The CAD/CHF is in a trend going up using the moving average indicators you see below. The trend you see is on the W1 time frame. The current resistance level is at 0.8600. We would set a price alert here. When the alert hits check The Forex Heatmap® to validate your buy entry point. We see no nearby resistance past there, any buy position has excellent upside potential. The EUR/CAD is moving inversely to this pair on the Canadian Dollar (CAD) strength and is trending down, it is breaking support levels on the largest time frames.